Ugh … not again. The all-too-familiar pain appears in your hand. The muscles cramp and the crushing pressure mounts. Nothing you do alleviates the ache, and the longer it persists, the more intolerable it becomes. You try with all your might to unclench it, move it to any other position. But, as in those nightmares where you try desperately to run, but cannot coax your legs to move, your hand feels paralyzed – because there is no hand. The sensation is so real, so intense, yet its origin is but a ghost … a phantom pain. As surreal as the phenomenon may sound, phantom pain emanating from a lost limb is a genuine, debilitating condition estimated to affect a staggering 50-80% of amputees 1. While some sufferers find relief from interventions such as pharmacologic analgesics or mirror therapy 2, the condition is intractable for others. A major challenge to treating phantom pain is our incomplete understanding of how the nervous system adapts following amputation. Phantom pain: poor real estate management? The face and lips lie adjacent to the hand in the brain’s sensory and motor cortices. When the hand is lost, these neighboring regions can invade the former hand area. 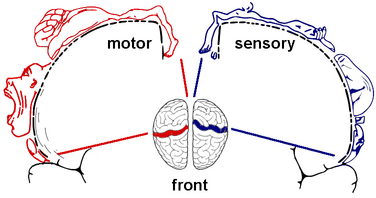 Once a limb is lost, the sensorimotor cortex, a brain region involved in moving the body and sensing touch, stops receiving normal input from the former limb. A well-supported theory posits that in response to this sensory deprivation, the brain, which we know is fantastically plastic, undergoes reorganization. To make better use of the newly available neural real estate, the brain region now unused by the former limb is gradually taken over by its closest neighbors. Since the area of sensorimotor cortex devoted to the hand is adjacent to regions that represent the face and lips, sensation in the face or lips would induce a false sensation in the missing limb. A study recently published in Nature Communications 3 challenges this prevailing theory, suggesting that phantom feelings arise from activating brain regions representing … the phantom limb! The researchers recruited one-handed amputees and two-handed controls to participate in a series of structural and functional magnetic resonance imaging experiments to explore how the sensorimotor cortex changes in response to sensory deprivation and phantom pain. To test whether the brain’s lip regions had in fact invaded the missing hand areas, as classic theories would suggest, they had participants smack their lips (for now, let’s overlook the horrendous motion artifacts this must have generated). They found no difference in hand-area activity between the amputees and controls, suggesting that the adjacent lip cortex hadn’t strongly taken over the phantom hand region. So if the lips hadn’t infiltrated the hand cortex, did this region still represent the lost hand? Activity in the sensorimotor cortex of amputees imagining moving their hands looked similar to activity when two-handed controls actually moved their hands. How could it be that years of sensory deprivation did not change the amputees’ brains? The researchers dug deeper and discovered that although the phantom hand area functioned normally, it was smaller in size and showed weaker connections to the region representing the opposite, intact hand, compared to controls. So the post-amputation brain does remodel, just not in the way traditional theories predict. Top: Compared to controls (2H), the phantom hand area of amputees (AMP) had a similar level of activity (left), but was smaller (middle) and less connected (right). Bottom: After removing the influence of phantom pain, phantom hand area activity and size were lower in amputees than controls, but connectivity was normal. Adapted from Makin et al., 2013. But what the scientists – and undoubtedly the amputees – really cared about was how these brain changes relate to phantom pain. Here’s where things really get interesting. The more phantom pain an amputee experienced, the greater the activity and size of their phantom hand region, but the less connectivity between phantom and intact hand areas. Next, to test whether phantom pain experience influences brain restructuring, they compared the groups again after removing the effect of phantom pain. Phantom hand area activity suddenly became lower than controls, and hand region connectivity became equal to that of controls. The authors interpret these findings as evidence that the phantom pain experience might actually drive cortical remodeling, increasing phantom limb brain activity and isolating the phantom region from the rest of the brain. Do you remodel like I remodel? These novel findings throw a heavy wrench into the classic reorganization model, arguing that phantom sensorimotor cortex is not invaded by adjacent cortex, but instead maintains an active representation of the phantom limb. The evidence is quite compelling, but so is prior research showing that neighboring cortex does invade the phantom region, and the extent of this remapping correlates with phantom pain intensity 4,5. The reason for these discrepancies isn’t clear. Individuals may exhibit unique patterns of brain restructuring after amputation, explaining why certain people experience more phantom pain or retain a stronger phantom limb representation than others. Although this study didn’t find that the adjacent lip region invaded the phantom hand area, we can’t be sure whether remapping really didn’t occur, was simply too weak for detection, or remapped from cortical areas representing the face or arm that weren’t tested. We’ll have to wait patiently for more research to answer these questions. Until then, we can only speculate that both processes – reorganization across body representations, and within the phantom representation – occur and interact with phantom pain experience. 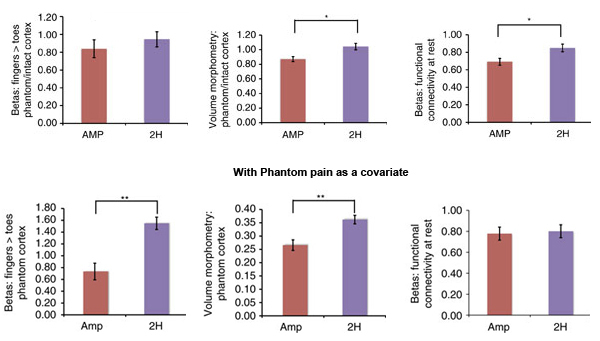 Contributing to a large body of work examining the source of phantom pain, this study turns the story on its head to show that the pain itself might alter brain structure and function. We know that the brain is constantly undergoing “experience-dependent plasticity” 6, adapting and responding to everything we do, think or feel. We may call it phantom, but to an amputee, their pain is intolerably real and debilitating. And to the non-discriminating brain, a sensation is a sensation; it is remodeled by experience, no matter how corporeal or ghostly in origin. 1. Jensen TS & Nikolajsen L. (1999). Phantom pain and other phenomena after amputation. In: Wall PD, Melzack RA, editors. Textbook of pain. 4th. Edinburgh: Churchill Livingstone. 799-814. 2. Ramachandran VS & Rogers-Ramachandran D. (1996). Synaesthesia in phantom limbs induced with mirrors. Proc Biol Sci. 263:377-86. 3. Makin TR, Scholz J, Filippini N, Henderson Slater D, Tracey I, Johansen-Berg H. (2013). Phantom pain is associated with preserved structure and function in the former hand area. Nat Commun. 4:1570. 4. Ramachandran VS & Hirstein W. (1998). The perception of phantom limbs. The D. O. Hebb lecture. Brain. 121:1603-30. 5. Flor H, Elbert T, Knecht S, Wienbruch C, Pantev C, Birbaumer N, Larbig W, Taub E. (1995). Phantom-limb pain as a perceptual correlate of cortical reorganization following arm amputation. Nature. 375:482-4. 6. Holtmaat A & Svoboda K. (2009). Experience-dependent structural synaptic plasticity in the mammalian brain. Nat Rev Neurosci. 10:647-58.